The Focus List has stabilized as we have not had to remove any more names from the list. However, financials began to weaken this past week, putting a name like Zions Bancorp (ZION) at risk as it tests its 50-day moving average. Financials have been a mainstay of the current market rally, and if they continue to weaken this could have implications for the general market unless we begin to see rotation into other areas. As this has been a highly rotational market, we would not be surprised to see this take place. We have already seen materials, infrastructure, and oil names, all of which were acting in a leadership capacity at the outset of the post-election market rally, fall by the wayside, but this had not put an end to the market rally. For now the rally remains intact, and we would note a number of names on our Focus List have been basing constructively or trending higher as they potentially pick up the slack for any faltering we might see in the financials as an area of market leadership. Both the Market Direction Model (MDM) and VIX Volatlity Model (VVM) remain on their buy and sell signals, respectively. We did, however, issue a report on Friday indicating that given the profitability of the most recent signal in the VVM, members might consider taking at least partial profits. We issued two pocket pivot reports this past week on Coherent (COHR) and Tesla (TSLA). Therefore these are new additions to the Focus List. Tesla (TSLA) posted a roundabout type of pocket pivot on Tuesday, ahead of the pricing of a $250 million secondary stock and $750 million convertible senior note offering. Both offerings were up-sized due to strong demand, but in the near-term this could saturate demand for the stock. Therefore we would be looking for a low-volume pullback into the 20-dema as a lower-risk entry. 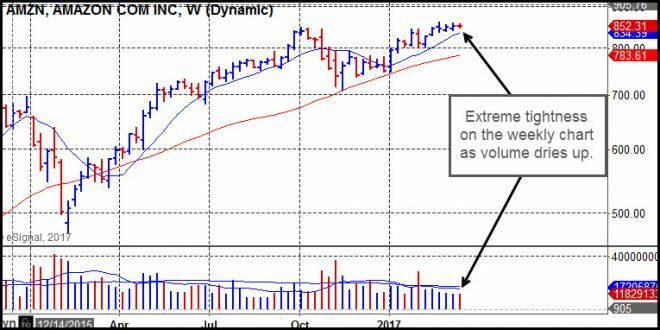 Should the stock breach the 20-dema and the 50-dma on heavy selling, the stock would then revert back to a short-sale target. However, keep in mind that the stock is selling at 19 times 2021 estimates, so is not necessarily overvalued. Ultimately it becomes a matter of execution in order to achieve or even exceed those earnings estimates. For that reason we would focus on the precise price-volume action of the stock rather than trying to adopt a rigid macro-bull or macro-bear position on the stock. Coherent (COHR) is a semiconductor name recently added to the S&P 500 Index. The stock has strong earnings and sales growth numbers, and posted a pocket pivot on Tuesday. It then pulled into the 20-dema, which put it in a lower-risk entry position, an has rallied to higher highs since. Amazon.com (AMZN) is holding very tightly on its weekly chart as the weekly price range narrow sharply. This is buyable right here, using the 20-dema as a tight selling guide, or for those who still operate according to what we consider to be somewhat antiquated methods, a standard O'Neil-style 7-8% downside stop could also be used. Alibaba (BABA) posted a pocket pivot on Thursday but pulled back slightly on Friday. This remains within buyable range using the 10-dma or 20-dema lines as selling guides. Alternatively, the 99.94 intraday low of its January buyable gap-up move serves as a wider selling guide for those with a higher risk-tolerance. Netflix (NFLX) is attempting to break out of the long consolidation it has formed since its January buyable gap-up. This may have sufficiently bored investors with its go-nowhere action such that it could finally attempt to get up and out of this current base after posting a new all-time high on Friday. 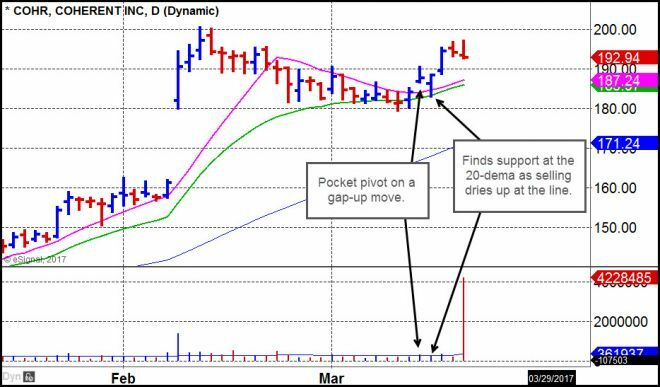 Netease (NTES) posted a nice pocket pivot at the 20-dema on Friday, which represent a strong recovery after dipping below the 20-dema on light volume earlier in the week. This is in a buyable position using the 20-dema at 287.08 as a selling guide. 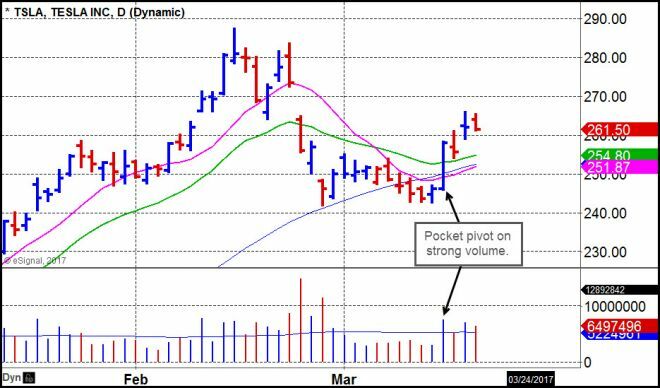 Square (SQ) has posted two five-day pocket pivots at the 10-dma. This is in a buyable position using the 10-dma as a selling guide. Otherwise, the 16.32 intraday low of its February buyable gap-up range would serve as a wider selling guide for those who have already taken a position lower in the pattern. Zions Bancorp (ZION) closed Friday just below its 50-day moving average. This makes it vulnerable to a violation of the line, which would serve as a confirmed sell signal.